The Kick-Fit ‘Kickboxing’ class is a medium to high intensity group exercise class suitable for beginners to intermediate ability levels. 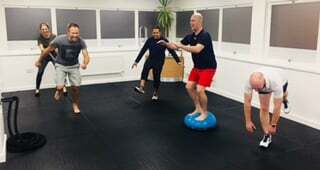 No matter what your experience level is, the instructor will guide you through each exercise, ensuring safe techniques are carried out at all times. The class is run by an experienced physiotherapist and keen martial artist himself so you are in good hands! The class will incorporate traditional kickboxing striking and defending techniques via pad-work and drills, alongside mixing in whole-body exercises to improve fitness, mobility, and ultimately burn those much needed calories! There is nothing better than whole-body exercises to achieve results! Participants enjoy this class as we create a fun and motivational environment, integrating striking/defending techniques, whilst at the same time emphasising heart-healthy cardiovascular fitness, muscular endurance/toning, muscular strength, core stability, and flexibility. Each week the instructor will build on the previous weeks’ techniques, pushing you to achieve your very best! Better yet, there is nothing better than hitting a pad after a long stressful day, releasing those ‘feel good hormones’ everyone talks about.